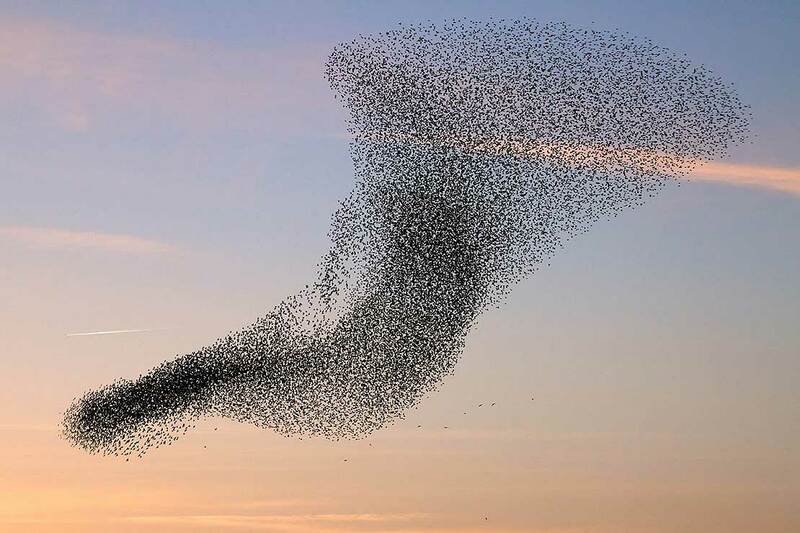 A flock of birds swarming across the sky is an example of a complex system in action. Complex problems are often left to experts to ‘solve’. But they tend to view the problem from a narrow-specialty perspective. This leads to interventions that may relieve the symptoms of the problem, but leave the underlying issues unresolved, causing the problem to reappear and with greater intensity. One approach for resolving this is to use complex adaptive systems. This is a new, exciting, interdisciplinary field of science for understanding and influencing the behavior by viewing complex systems (e.g. organisations, communities, cities) as living organisms. This is in stark contrast to the prevalent Newtonian view of the universe, which by extension, views human organisations as machines. In living systems, entities constantly evolve and adapt in the face of new circumstances in order to sustain themselves. This process is only partially subject to ‘authority’ or ‘management’ influence and cannot be predetermined or controlled. Not only is the behaviour of a complex system unpredictable – it is emergent. That is, the behaviour of the whole system cannot be simply inferred or understood from the behaviour of its parts. 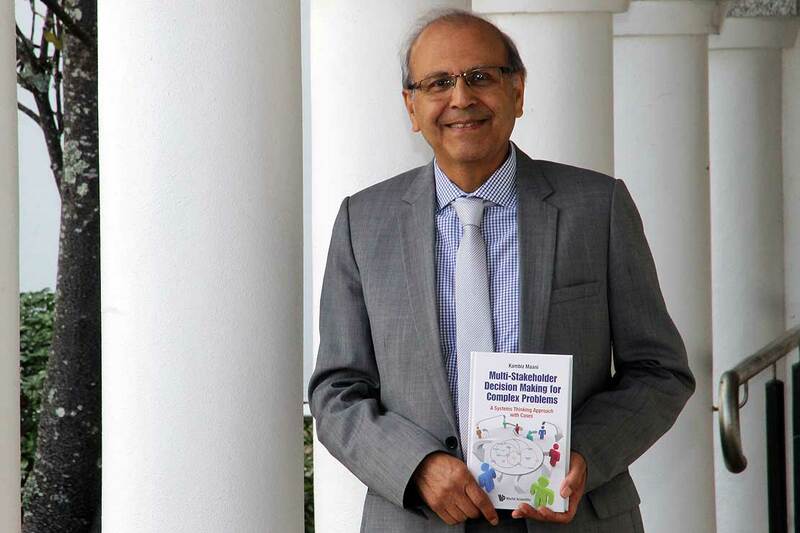 Professor Kambiz Maani with his book on how organisations can deal with complex problems. Ecosystems are examples of complex adaptive systems, in which higher patterns emerge from interactions at lower levels. A flock of birds swarming across the sky forms a complex system. No single bird is in charge, yet the flock's behaviour is organised and exhibits “collective intelligence”. The human brain is another example where the firing of some neurons affects the firing of other neurons and the whole-brain system can influence the individual neurons. Internet and stock market are, likewise, complex systems where no single authority ‘controls’ their functioning. Nor is their behaviour predictable directly from the behaviour of the individual actors. Social, political and economic systems also involve mutually adaptive interactions that produce unpredictable patterns. In a complex system, it is not uncommon for small changes to have big consequences (i.e. the butterfly effect), big changes to have surprisingly small effects and some effects to come from unanticipated causes. For example, an elaborate health education programme may yield no effect on health in one community, while having a major impact in another; the adoption of a ‘smart’ new financial instrument can eventually contribute to a chain of stock market collapses and business failures. Recently, two Nobel Prizes were awarded to studies applying complexity to economics. The research of Paul Krugman, an MIT economist, explains the existence of clusters of economic activity and regional growth disparities by examining economies as complex adaptive systems. This work has already influenced city planners and economic geographers, among others. A study by Thomas Schelling from the University of Maryland found that residential segregation tends to emerge in neighborhoods where citizens hold only a few simple preferences for being near people like themselves, even in the absence of racism or hatred. Political thinkers have compared Newton's colliding atoms to the behaviour of individuals in society, but these ideas are becoming out-dated. Viewed from a complexity lens, organisations are a web of relationships and feedback loops. Complexity challenges the assumptions of stability, predictability and control underlying contemporary management and strategic planning. World-shaking events, such as the fall of the Soviet Union, the collapse of the Berlin Wall, the 9/11 attacks, and the global financial crisis were not predictable; they were emergent outcomes of complex interactions and feedback cycles unfolding over a long period of time. The long-held management edict “predict and plan” no longer holds true. In the past three decades, the principles of complexity science have increasingly been applied to organisations and leadership. Organisations as diverse as Boeing and the OECD and policymakers in sectors including healthcare, development, and education have applied complexity principles in a wide range of applications, such as strategic planning and management, operational design, and capacity development. Today, the applications of complexity science encompass every domain and sector including public health, climate policy, corporate strategy, public management, energy modelling and the environment – and many more. Several authors have contrasted the 17th century Newtonian laws and precepts with the ‘new sciences’ of complexity and quantum physics. 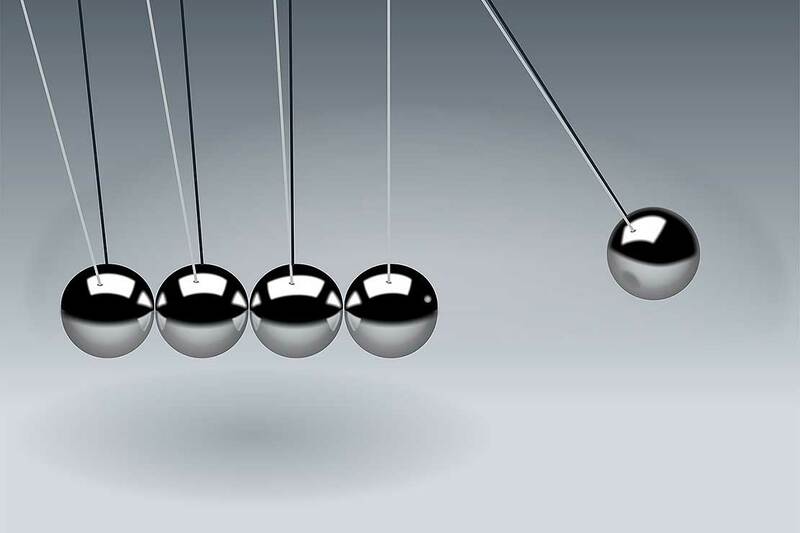 Danah Zohar, an Oxford physicist, explains the nature and implications of these laws to management and society: "The basic building blocks of Newton's physical world were isolated atoms that bounce around in space and collide with one another like billiard balls. Political thinkers of the time compared these colliding atoms and their interacting forces to the behaviour and interactions of individuals in society as they confront each other in pursuit of their self-interest … Still today, economists and sociologists who follow 'Rational Choice' theory argue that individuals will always choose to act in pursuit of their own self-interest". The implication of this thinking pervades management practices still, as manifested in notions of hierarchy and control, belief in stability, certainty and the absolute, a single 'correct' point of view, isolated, separate and interchangeable parts, the specialist expertise and relationships based on conflict and confrontation (e.g. partisan politics). The Industrial Revolution precepts, including division of labour, free market economics, mass production and scientific management, all embody the above principles. The Newtonian laws have helped humans to walk on the moon and they have made our physical chores trivial. However, the philosophical extensions of the thermo-mechanical laws to social and political domains have outlived their useful purpose. As futurist Alvin Toffler observed, "the Age of the Machine is screeching to a halt". Deregulation of the United States savings and loan industry, designed to save the industry from financial problems, leads to a wave of speculation, followed by collapse. A University of Utah study of 13,000 patients finds limiting the drugs supplied to patients has the unintended effect of increasing costs. Road building programmes designed to reduce congestion increase traffic, delays, sprawl, and pollution. Low tar and nicotine cigarettes increase intake of carcinogens and carbon monoxide as smokers compensate for the low nicotine content by smoking more cigarettes per day. Also, cigarette taxes aimed at curtailing smoking increase cigarette smuggling and financing of terrorism. Fire suppression actions increase the number and severity of forest fires. Flood control efforts such as levee and dam construction lead to more severe floods by preventing the natural dissipation of excess water in flood plains. Antibiotics stimulate the evolution of drug-resistant pathogens, including virulent strains of TB, strep, staph, and sexually transmitted diseases. Use of pesticides and herbicides stimulate the evolution of resistant pests and weeds. To counter the reductionist and myopic approaches to complex problems, system thinking has emerged as a scientific methodology for decision-making. It views complex issues as a web of inter-related elements, the interaction of which causes the problems, and the solution to which requires finding 'leverage' points that require holistic and collaborative interventions. The aim is to change the system, not the symptom.